What is the weight rating of each tine? What is the height and width? The Minimum Breaking Strength is 3900 lbs for each individual tine. The tines are heat-treated so they do not break. They are ductile enough so they should spring outwards rather than snap off. 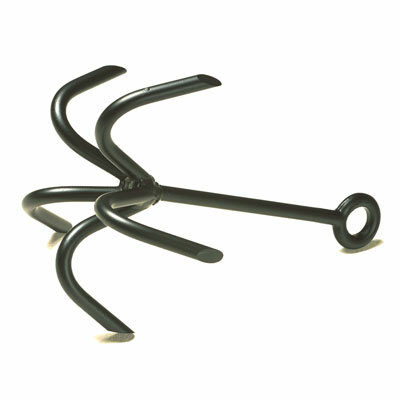 The grappling hook is 13" tall and 8" across. I purchased the grapple to retrieve 2 air pipes at a waste water treatment plant. Several others that I have retrieved had "T" sections on the bottom. These turned out to be straight pipes lying on the bottom and thus were not retrievable. Not you fault, my fault. This was in a digester thus not visible.